In April 2008, the world was left stunned after it had emerged that a non assuming man, Josef Fritzl, had in fact imprisoned his daughter Elisabeth Fritzl for 24 years. In this time, Elisabeth would mother 7 children, with 1 passing away and 3 being brought up by her mother and father. This spine chilling episode would inspire Emma Donoghue to create her Commonwealth Writers’ Prize winning novel Room, is a narrative set in similar conditions to that of Elisabeth but told from the perspective of a 5 year old named Jack. Courtesy of Theatre Royal Stratford East. What is apparent throughout the evening is the book’s wealth of themes. As an observer you are constantly thinking, you’re analysing Ma and Jack’s reality. Jack has never seen anything past the cluttered and claustrophobic subteranean existence he considers to be his ‘normal’, however the audience are aware of his mother’s traumatic reality, and how her life had changed in a matter of seconds 7 years prior. The production plays on our feeling of freedom, the audience watch in a place of safety, we are on the ‘outside’, we are the viewers tuning into the 6 o’clock news, in utter shock at the horrendous crimes happening in the world, whilst these 2 protagonists are imprisoned against their will, on the ‘inside’, oblivious as to the goings on beyond their 4 walls. Donoghue offers a complexity on a crime, fleshing out the news items we as viewers are accustomed to. Witney White brings a subtly to the character of Ma, she exhibits a child like nature that further adds an authenticity to the fact she was in her teens when she was kidnapped. This child-like quality is prevalent, however this shouldn’t stop there being a variation and intensity in emotion which there could be more of. Taye Kassim Junaid-Evans steals the show as a bold yet mild mannered Little Jack. Naive to their current living situation, Junaid-Evans’ constant optimism is heart breaking. To Jack, their situation is safe however everyone else knows otherwise. This constant dramatic irony sums up Ma and Jack’s relationship. Fela Lufadeju offers a sense of stability in this uncomfortable narrative, his role of Big Jack articulating the silences, articulating the thoughts of Little Jack. Liam McKenna‘s Old Nick is a vile and imposing presence, the audience are left to feel nothing but hatred towards him and the unforgiving situation he has placed his captives in. Stephen Casey and Lucy Tregear as Grandpa and Grandma successfully contribute their idea of ‘normal’ life to the two protagonists. The audience watch as the two protagonists attempt to assimilate to everyday life after their traumatising experience, however struggle- the beginnings of PTSD showcasing its unrelenting presence. 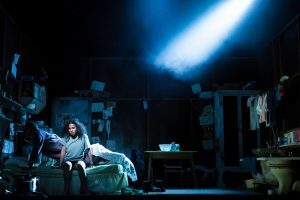 The world of this production of Room is realised by Video Designer Andrzej Goulding. From the very moment the audience take their seats, the video projections steal your attention. A birds eye view of both the protagonists inside a cluttered claustrophobic space plays on a loop. This instantaneously is gripping as you wonder whether the video is filmed in real time. Projections of the young boy’s drawings and writing decorate walls; drawings of space, monsters, fire amongst other things help to add a child-like quality to the evening. Various video screens cascading from the ceiling showcase images of news reports about the mother and child’s kidnapping capturing the madness of the media circus. The screens also depict the multi-sensory experience of visiting a shopping centre, especially in the case of a child who has never stepped foot into the outside world, therefore capturing the chaos of this experience. Silhouettes of news reporters projects onto a clinical white curtain and raindrops pepper the stage, projected on the outside of a see through, hollow house frame. An inventive use of projection, a master class.